1. Drain the tofu and dry using thick kitchen towels. Replace wet towels and continue to dry for 15 minutes. Cut the tofu into half inch cubes. 2. Mix cornflour, cornmeal, paprika and salt in a bowl and toss the tofu cubes till well coated and place on greaseproof paper. 3. Heat a griddle or pan, add 2 tbsp of oil and grill the tofu cubes, flipping them to ensure that they are evenly cooked. Remove and set aside to cool. 4. In a pan heat the rest of the oil and add onion, carrot, peppers, ginger-garlic paste and saute on high for 4-5 minutes until crisp and tender. 5. Remove from stove, add chopped coriander and 1 tsp lime juice , mix well and allow to cool. 6. Heat a pan on medium heat and add soy sauce, red and green jalapeno pepper paste and stir well while it thickens and bubbles. Toss the tofu cubes in the sauce. 7. 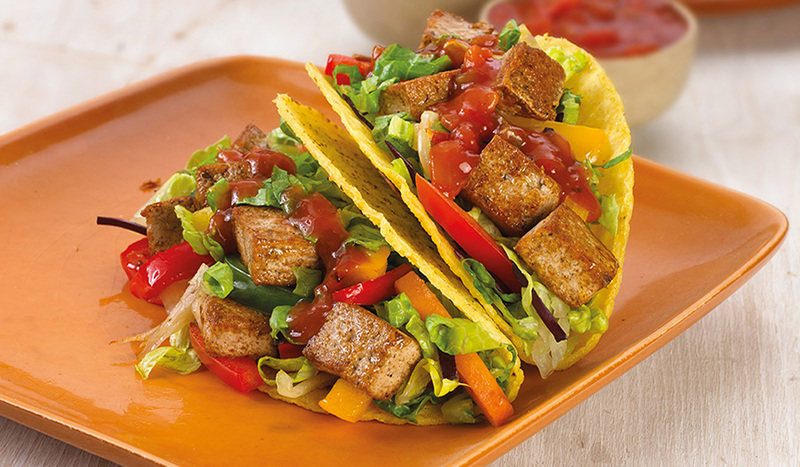 Place the vegetables into a taco shell. Add a few tofu cubes. Add some taco sauce to taste, shredded cheddar and chopped coriander.